A novel ultra-high strength precipitation hardened martensitic steel with balanced ductility and creep resistance has been developed. 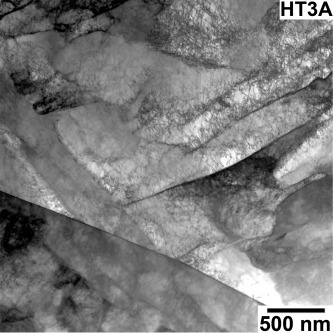 It utilises a unique combination of nanometre scale intermetallic precipitates of Laves phases and β-NiAl to achieve such properties. The mechanical properties of this steel were assessed by tensile and creep testing. With different heat treatments, this steel showed a remarkable combination of mechanical properties: yield strength of >1800 MPa, ultimate tensile strength of about 2000 MPa, tensile ductility up to 8% at room temperature and creep rupture life in excess of 2,000 h under 700 MPa stress at 500°C. The microstructures at different length scales were characterised using scanning / transmission electron microscopy and atom probe tomography. The austenisation and ageing temperatures were found be the key factors determining the microstructural development and resulting mechanical properties. Large primary Laves phase precipitates formed at lower austenisation temperatures resulted in reduced creep strength; whilst the small difference (20°C) in ageing temperatures had significant impact on the spatial distribution characteristics of β-NiAl precipitates. Lower ageing temperature produced much smaller but more uniformly distributed β-NiAl precipitates which contributed to the higher observed yield strength. It is clear from this study that whilst this novel alloy system showed great potentials, careful design of heat treatment is still required to achieve balanced mechanical properties to meet the service requirements in aerospace propulsion systems. Acta Materialia 149 (2018) 285-310. "Effect of a two-stage heat-treatment on the microstructural and mechanical properties of a maraging steel"
"SANS and APT study of precipitate evolution and strengthening in a maraging steel"
Materials Science and Engineering A, 702 (2017) 414-424.